Cavitation occurs quite frequently in engine coolant pumps and can produce various problems, notably erosive wear on pump components, aeration of the coolant, excessive noise and vibration. This commonly results in failure of the pump's seal, followed closely by bearing failure, leading to reduced engine cooling and ultimately failure of the pump itself. Clearly, these are all serious problems but seal failure in coolant pumps is of particular concern for OEMs, since it is a major cause of engine-related warranty claims. This has tended to focus attention (and blame) on the seal's design, but in many cases seal failure is symptomatic of other inherent problems within the cooling system, which have not been avoided at the design stage. In such cases, even the pump may be only part of the problem and, by taking a system perspective, designers can achieve significant improvements in performance as well as reliability. This article sets out some simple basic design considerations that will significantly reduce the likelihood of cavitation occurring as well as the associated failure modes. What is cavitation and why does it occur? followed by the implosion of the vapour bubble within the coolant circuit. Vaporisation of the fluid occurs if the fluid reaches its vapour pressure point, normally as a result of a combination of pressure and temperature conditions. The graph shown in Figure 2 illustrates a typical vapour pressure characteristic for long-life engine coolants. As can be seen, the concentration of coolant relative to the water content has a major influence on the temperature and pressure at which vaporisation occurs. With engine coolants typically operating within the 90ºC - 110ºC range and coolant concentration levels usually being 50%/50%, it can be seen that the pressure to cause vaporisation typically occurs between 50kpa and just over 100kpa absolute pressure, with 100kpa being atmospheric pressure. The graph highlights the need for vehicle coolant systems to operate at elevated pressures during hot running conditions. Normally the worst-case scenario will be when the engine is running hot, with the coolant running through the radiator at full flow rate. If there is relatively low pressure at the radiator outlet, combined with high coolant temperature, the fluid is in danger of vaporising. The coolant temperature at the pump inlet is lower than that at the engine outlet because of the temperature gradient across the radiator. Ideally, radiators are sized to accommodate a sufficient temperature gradient from the engine outlet, when there is minimum airflow, based on a high load condition of the engine, typical of a hot ambient trailer tow test. Within the coolant pump, it is normal for a local pressure reduction to occur at the entry to the pump impeller. This local pressure reduction is caused by the sudden acceleration in the velocity of the fluid as it enters the rotating impeller. If this local pressure reduction, along with the increased temperature of the coolant, enables the fluid to reach the vapour pressure point, then fluid vaporisation will occur, normally within the passageways between the blades of the pump impeller. As the fluid pressure increases across the diameter of the impeller, the vapour bubble is likely to implode causing localised damage to the impeller and to a lesser extent to the pump housing. Figure 4 Illustrates extreme damage patterns from cavitation within centrifugal pumps. By comparing the conditions required to prevent the fluid reaching its vapour pressure point at the pump inlet and contrasting these with conditions that are actually available within the cooling system, it is possible to determine if a margin of safety is available or not. This can be determined from the following equation. Ps Abs is the absolute pressure head of the fluid at the point normally considered the pump inlet (m). Pv is the vapour pressure head of the fluid at the temperature and concentration considered (m). Pressure head = P / r g (m), where p is pressure in Pa. It is normal to determine the NPSH for a given speed and flow rate prior to vaporisation and term this NPSHr (Net positive suction head required). Most pump manufacturers are able to provide NPSHr curves which indicate the reduction in total pressure head at individual flow conditions at a constant speed, based upon tested data. From the NPSHr against total head plot, an NPSHr against flow plot can be produced for individual operating speeds of the pump. Given the NPSHr data supplied by the pump manufacturer, it is possible to calculate the NPSHa (Net positive suction head available) from the cooling system. This involves considering the lowest pressure at the pump inlet connection and highest estimated coolant temperature possible at the pump inlet, then calculating the NPSHa. If the NPSHa is greater than the NPSHr, then cavitation should not occur. However in the author's experience many engine coolant systems have a lower NPSHa than the NPSHr at the coolant pump. What can be done to achieve a positive margin of NPSH? Heat rejected into the coolant is a function of engine load; therefore an extreme form of protection could be to de-rate engine power as coolant temperature begins to rise to problematic levels. Clearly this would be regarded as undesirable by the OE manufacturers, since it limits the power capability of the engine. Such an approach would also require an additional control strategy linked to a fluid temperature measurement, adding cost to the coolant system. Increasing the pump inlet pressure can be achieved by means of the pressure relief setting on the header tank cap, but caution is required since this has implications for the pressure rating of all components within the cooling system. It is not always practical to ensure a minimum header tank pressure, particularly as it is possible to run the engine without the cap, thereby reducing the coolant system pressure to atmospheric levels. One possible solution would be to provide for a proportion of the outlet flow from the coolant pump to recirculate back into the pump inlet so enabling a 'supercharge effect' which boosts pressure at the pump inlet. If this is achieved with significant additional inlet flow rate but without impeller geometry changes, then the gain can be offset by increases in eye velocity. However, in practice,the resulting reduction in static pressure will dilute the effect of the incoming boost pressure. As can be seen from Figure 2, increasing the concentration of the engine coolant will cause an increase in NPSHa; however this requires the coolant concentration to be maintained at these levels throughout the engine life, which will be difficult to control due to coolant changes at scheduled service intervals and occasional top-ups. The coolant pump designer and the coolant system designer can minimise the losses that lead to reductions in pressure, which is particularly important at the pump inlet. Simple considerations at an early point in the design process can make a good contribution, such as avoiding sharp bends near the pump inlet, as they tend to cause unwanted fluid rotation at the impeller entry. In addition, any bends in the system will reduce the static pressure through friction losses. This loss will be related to the inlet velocity, as shown in Figure 6. Rapid accelerations or decelerations in the pump entry must be avoided, in particular sudden expansions or contractions, as these can lead to significant losses, again related to velocity, as illustrated in Figure 7. The coolant pump impeller, if designed correctly, will be optimised, particularly at the vane leading edge to minimise any shock losses as the fluid impacts the impeller vane. This is achieved by matching the incoming velocity vector with the correct impeller vane angle. Because centrifugal pump impellers normally have fixed vanes, the inlet blade angle is optimised for a particular inlet velocity vector, normally at the design specification point, which will typically be peak operating efficiency. It is therefore preferable to operate the pump as close to its design point as possible, since this is normally the point of minimum NPSHr. Operation away from the design operating point also leads to recirculation flows within the impeller entry and exit as shown in Figure 8. Opposing fluid flow regimes create vortices leading to localised high velocity and reduced static pressure. 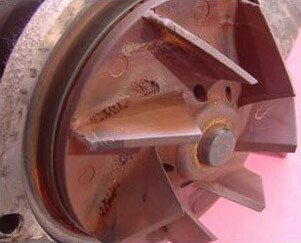 In addition to suction side damage this can lead to cavitation damage on the pressure side of the impeller vanes as seen in Figure 4. In non-automotive applications such as the process industry, it is not unusual to utilise an additional inducer impeller to provide a boost pressure for the main pump impeller. Normally the inducer would provide an extension to the main impeller, protruding into the pump inlet. Pump NPSHr in general will follow scaling laws for centrifugal pumps, which means NPSHr will vary in a squared relationship to changes in pump speed. This is because higher rotational speeds will lead to increased fluid accelerations as the fluid contacts leading edges of the impeller, resulting in larger localised reductions in static pressure. For these reasons, the pump designer would normally favour low rotational speeds to avoid cavitation. However, this needs to be balanced with the physical packaging constraints of the engine and the need to maximise pump efficiency, which can often be improved with increasing speed. As is common in centrifugal pump design practise, empirical data is very important to correlating mathematical relationships. Haldex Concentric has been manufacturing coolant pumps for over 50 years and so significant data has been accumulated to enable accurate modelling of the factors that most influence the localised static pressure reductions at the pump inlet. The in-house developed software considers the velocity profile both in the pump inlet housing and at the impeller inlet which, together with empirical loss coefficients, enables accurate prediction of NPSHr for all but the most extreme geometries. As with all empirical relationships, once the geometry departs significantly from the base correlation data, the correlation between the two becomes less accurate. Computational fluid dynamics (CFD) has advanced greatly in recent years, enabling much greater accuracy of even the most complicated flow regimes. Haldex Concentric is increasingly utilising both CFD and in-house software to refine predictions of NPSHr. To ensure that a suitable margin of NPSH is achieved on a new engine project, the coolant system designer should provide data concerning maximum coolant temperature, coolant specification details and the associated minimum coolant pressure adjacent to the pump inlet. In addition, the housing or pipework inlet geometry that may influence the pump inlet flow conditions needs to be defined. These conditions should be considered at both open and closed thermostatic valve conditions. Computational fluid dynamics (CFD) may be required to accurately calculate inlet pressure and velocity profile, dependant upon the complexity of the coolant system. With this information the pump designer can then confirm the NPSHa. The pump designer's task is then to generate a design scheme to achieve the specification flowrate and pressures required at the specified engine speeds. NPSHr would be calculated on the basis of either an assumed drive ratio from engine speed or in some cases a defined drive ratio from the engine designer. With both NPSHa and NPSHr defined, the consideration of a suitable margin can be made. This consideration should be made at all operating speeds, with overspeed usually providing the most difficult condition. If the result is a negative margin, both the pump designer and the engine coolant system designer can evaluate the variables under their control to move towards a positive condition. It should be noted that a significant proportion of engines are likely to operate in negative NPSH margin at some point in their operating cycle. This needs to be considered relative to the anticipated time duration. Coolant pump seals will tolerate some degree of dry running; however the best form of defence against potential problems will always be avoidance of any dry running conditions wherever possible. Avoiding cavitation in engine coolant pumps is a system design issue that requires close co-operation between the pump designer and the coolant system designer. Once the system has been developed, any after-treatments that have to be adopted can be both expensive and of limited effectiveness. Haldex Concentric has developed its own in-house design software that can accurately predict NPSHr at the specification stage within a pump project. By considering NPSHa relative to NPSHr up-front, this software identifies the potential for cavitation and any related problems early in the engine design cycle. It is known that many current engines operate under negative NPSH margin for varying periods of their operating cycle; however it is also known that coolant pump leak problems are not uncommon on modern engines. Adoption of an NPSH positive margin in all operating modes is likely to lead to a significant reduction in seal leak problems.